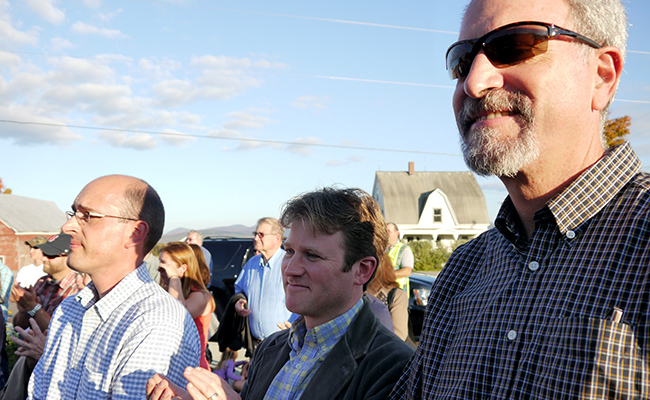 Members of the school board, community, design and construction team– even East Montpelier resident Governor Peter Shumlin, gathered on a beautiful fall evening to celebrate the completion of the renovations of the school designed by TruexCullins. Students led tours throughout the facility and showed parents and others their favorite spaces. Afterwards there was a spaghetti dinner open to the public. This project included new classrooms, library and cafeteria and a complete renewal of the existing school building. Renovations included new windows, roofing, wall and roof insulation, lighting and flooring throughout. Innovative energy recovery ventilators were provided for each classroom, ensuring ample fresh-air on demand. With the help of local resident Andy Shapiro, the entire building was air-sealed to minimize heat loss through infiltration. Investing in education reflects a community’s values and with this project, East Montpelier has spoken volumes. Their team of Flor Diaz Smith, Alicia Lyford, Bill Kimball and Marion Anastasia were a delight to work with. We here at TruexCullins are so happy for the East Montpelier community and what they accomplished on behalf of their student’s education. We hope they get many years of value for their investment. Stay tuned for photos of this school project – they should be on our website soon!